Follow us on facebook if you don't want to miss our hottest deals and or newest hotels! The 4-star thermal hotel Danubius Hotel Gellert located in the centre of Budapest, overlooking the Danube, is waiting for the guests who are looking for a traditional Grand Hotel with classical style. The spa hotel offers various types of rooms, 24-hour secured parking, thermal bath & spa and business centre. 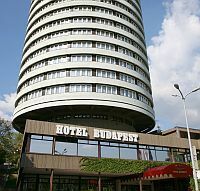 The four-star Hotel Budapest**** with its unique cylindrical-shaped architectural style offers the most beautiful panorama of Budapest. This Danubius hotel is ideal for conferences, corporate meetings or other special events.